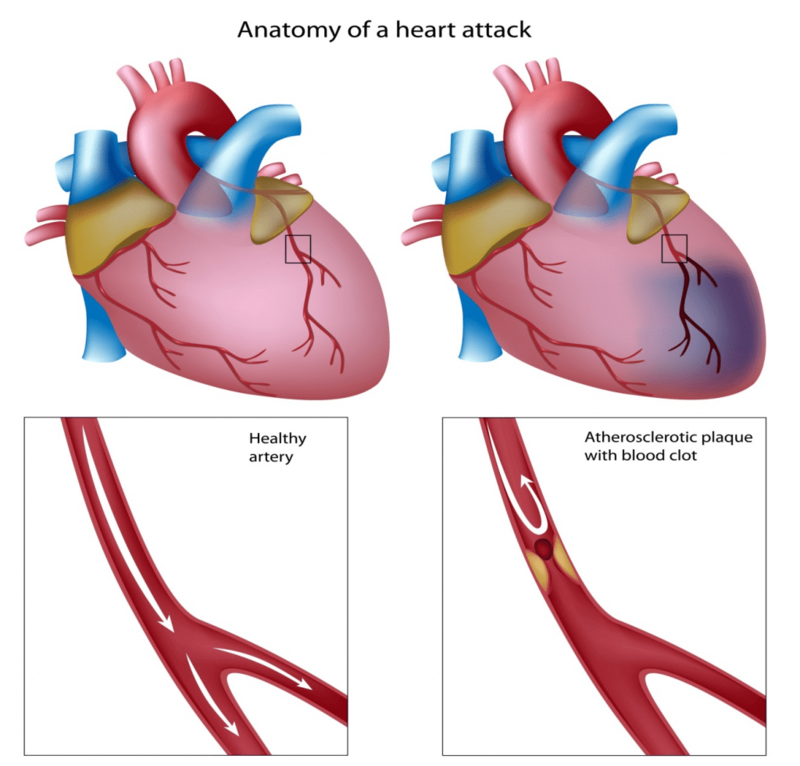 Heart attack, technically known as myocardial infarction (MI) or acute myocardial infarction (AMI), occurs due to the diminution of blood supply to a part of the heart, causing that particular heart cells to die. Heart attack most commonly occurs due to occlusion (blockage) of a coronary artery following the rupture of a vulnerable atherosclerotic plaque. It results in restriction in blood supply and oxygen shortage ensues. If this situation is left as such without treatment for a sufficient period of time, it can cause damage or death (infarction) of heart muscle tissue (myocardium). The unwanted buildup of fatty deposits (atherosclerosis) that narrows arteries throughout your body, including arteries to your heart, is contributed by certain factors. It is possible to improve or eliminate many of these risk factors as this decreases your chances of having a first or subsequent heart attack. Age – A heart attack is more common in men who are 45 or older and women who are 55 or older. Smoking – Active smoking and/or long-term exposure to secondhand smoke damages the interior walls of arteries allowing deposits of cholesterol and other substances to collect and slow blood flow. These arteries include arteries of your heart, along with other arteries. Risk of deadly blood clots forming and causing a heart attack is also increased by smoking. Diabetes – Diabetes, a disease where the body is unable to adequately produce insulin or respond to insulin need properly, occurs more often in middle age and among overweight people. Patients with diabetes are at a great risk of a heart attack. Blood pressure – Increased blood pressure over years damages arteries that feed your heart by accelerating atherosclerosis. As you age, the risk of high blood pressure increases, but the main culprits for most people are eating a diet too high in salt and being overweight. Hypercholesterolemia – Deposits occurring in the arterial walls mainly consist of cholesterol and can narrow arteries throughout your body, including those that supply your heart. High blood levels of bad cholesterol increase your risk of a heart attack. Low-density lipoprotein (LDL) cholesterol (the “bad” cholesterol) is most likely to narrow arteries. This LDL increases due to a diet high in saturated fats and cholesterol. It is undesirable to have a high level of triglycerides, a type of blood fat related to your diet. But, HDL, a good cholesterol, which helps the body clean up excess cholesterol, is desirable and lowers your risk of heart attack. The family history of heart attack – In case any of your sibling, parents or grandparents have had a heart attacks, you may be at increased risk. You and your family might be genetically predisposed to increased unwanted blood cholesterol levels. High blood pressure also can run in families. No or less physical activity – High blood cholesterol levels and obesity are caused by an inactive lifestyle. Regular aerobic activity leads to better cardiovascular fitness, which decreases overall risk of heart attack. Exercise is also beneficial in lowering high blood pressure. Obesity – Being overweight leads to the high proportion of body fat (a body mass index of 30 or higher). Risk of heart attack is increased by being overweight as it’s associated with high blood cholesterol levels, high blood pressure and diabetes. Stress – Inappropriate response to stress can increase your risk of a heart attack. Being constantly under stress leads to overeating or smoking or drug abuse from nervous tension. Too much stress, as well as anger, can also raise your blood pressure. Illicit drug use – Drug abuse with cocaine or amphetamines can trigger a spasm of your coronary arteries that can cause a heart attack. When one or more of the arteries supplying your heart with oxygen-rich blood (coronary arteries) become blocked, it results in heart attack. With the passage of time, a coronary artery can become narrowed from the buildup of cholesterol called plaque. This process of the plaque buildup in arteries throughout the body is called atherosclerosis. One of these plaques can rupture during the heart attack and a blood clot forms on the site of the rupture. A complete blockage of flow through artery occurs if the clot is large enough. Coronary artery disease occurs when your coronary arteries have narrowed due to atherosclerosis. Most heart attacks occur due to coronary artery disease. Spasm of a coronary artery that shuts down blood flow to part of the heart muscle is another uncommon cause of a heart attack. The life-threatening spasm can occur due to drugs such as cocaine. A tear in the heart artery (coronary artery dissection) can also cause the heart attack. Small blood clots or tumors that have traveled from other parts of the body (coronary embolism) are other uncommon causes of heart attack. The heart attack is a culmination of a several hours long process. More heart tissue is deprived of blood and deteriorates or dies with each passing minute. Damage to the heart can be limited or prevented if blood flow can be restored in time. Symptoms of a heart attack may vary. All patients with a heart attack do not experience the same symptoms or experience them to the same degree. Another interesting feature is that many heart attacks aren’t as dramatic as the ones you’ve seen on TV. In some patients, there are no symptoms at all. Still, the more signs and symptoms you have, the greater the likelihood that you may be having a heart attack. The timing of heart attack is not fixed and it can occur at any time of the day— at work or play, while you’re resting, or while you’re in motion. In some patients heart attacks strike suddenly, but many people who experience a heart attack have warning signs and symptoms hours, days or weeks in advance. Most common and earliest warning of a heart attack may be recurrent chest pain (angina) that are triggered by exertion and relieved by rest. A temporary decrease in blood flow to the heart causes angina. Electrocardiogram (ECG). It is an electrical recording of the signals as they travel through your heart. Evidence of a previous heart attack can be revealed by an ECG. If the signs and symptoms of your atherosclerosis are more evident during exercise, your doctor may ask you to walk on a treadmill or ride a stationary bike during an ECG. Blood tests. Blood is tested for the elevation of certain heart enzymes that slowly leak out into your blood if your heart has been damaged by a heart attack. Stress test. A stress test is also an exercise stress test. It is used to gather information about how well your heart works during physical activity. By doing exercise on bike or treadmill your heart pumps harder and faster than it does during most daily activities. Testing of the heart during and after exercise can reveal problems within your heart that might not be noticeable otherwise. The procedure usually involves walking on a treadmill or riding a stationary bike while your heart rhythm and blood pressure and breathing are monitored. In some types of stress tests, pictures will be taken of your heart, such as during a stress echocardiogram (ultrasound) or nuclear stress test. In patients who are unable to exercise due to some or other reason, a medication that mimics the effect of exercise on the heart is used to make it pump harder. Echocardiogram. It is a type of ultrasound examination of your heart to produce images of the heart. These images are seen by the doctor to identify heart attack-related problems, including whether there are areas of your heart not getting enough blood or heart muscle that’s been damaged by poor blood flow. Sometimes, an echocardiogram is performed during a stress test. Coronary angiography. Narrowing or blockade in coronary arteries can be revealed by this test. The test involves injecting a liquid dye into the arteries of your heart through a long, thin tube (catheter) that’s fed through an artery, usually in your leg, to the arteries in your heart. The arteries become visible on X-ray, as the dye fills your arteries. Any area of blockage can then be revealed. Cardiac computerized tomography (CT) scans. During the performance of this test, you lie on a table inside a doughnut-shaped machine. Inside the machine, there is an X-ray tube which rotates around your body and collects images of your heart and chest. These images can show if any of your heart’s arteries are narrowed or if your heart is enlarged. Abnormal heart rhythms (arrhythmias). Electrical “short circuits” can develop if your heart muscle is damaged from a heart attack. These can cause abnormal heart rhythms, some of which can be serious, even fatal. Heart failure. It is a condition where the damaged tissue in your heart can’t do an adequate job of pumping blood out of your heart. Reduced pumping activity reduces blood flow to tissues and organs and may produce shortness of breath, fatigue, and swelling in your ankles and feet. Heart rupture. A hole in a part of a wall of the heart can occur due to rupture of areas of heart muscle weakened by a heart attack. This rupture is often fatal. Treatment of a heart attack varies depending on the situation. The patient might be treated with medications, undergo an invasive procedure or both — depending on the severity of the condition and the amount of damage to the heart. Aspirin – It reduces blood clotting, thus helping maintain blood flow through a narrowed artery. Thrombolytics – Also called clot busters, these drugs help dissolve a blood clot that’s blocking blood flow to your heart. Superaspirins – These are aspirin-like drugs with improved ability to prevent clot forming and include clopidogrel. Blood-thinning medications – Medications like heparin might be given to make your blood less “sticky” and less likely to form more dangerous clots. Pain relievers – The heart attack is associated with intense chest pain and you may receive a pain reliever, such as morphine, to reduce your discomfort. Nitroglycerin – This medication temporarily opens arterial blood vessels, improving blood flow. Beta-blockers – These medications help relax your heart muscle, slow your heartbeat and decrease blood pressure making your heart’s job easier. Cholesterol-lowering medications – Unwanted blood cholesterol levels are lowered by these medications. Angioplasty and stenting – These are used when unstable angina or lifestyle changes and medications don’t effectively treat your chronic, stable angina. Coronary artery bypass surgery – This is done when stenting doesn’t help. It is a major surgery on heart arteries and involves creating a graft bypass using a vessel from another part of your body or a tube made of synthetic fabric. With this procedure, blood flow is maintained around the blocked or narrowed artery.